Product Size : 30″ X 15″ X 30″ in inches approx. 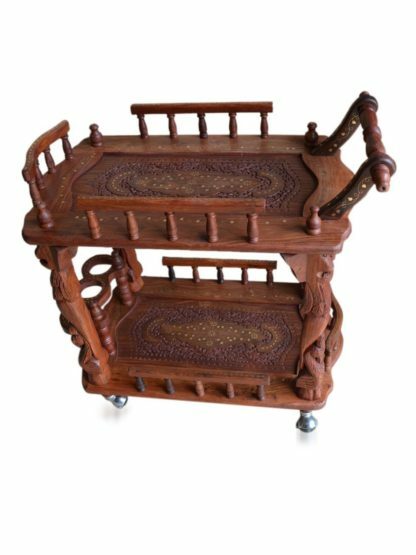 Handcrafted Wooden Service Trolley made by skilled artisans from Sheesham Wood (Indian Rosewood) with floral carving and brass inlay work. The unit comes in Knock-Down state and can be assembled in minutes without any assistance required from carpenters. Please note that the size and color may vary slightly as this is a handcrafted unit. 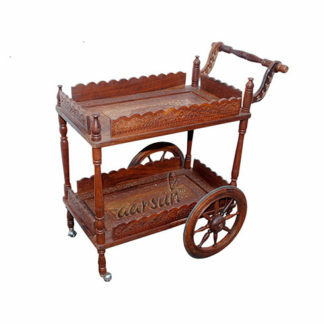 Aarsun Woods brings to you this Handcrafted Wooden Service Trolley made by skilled artisans in Traditional Floral Design. The unit unit consists of 2 rectangular trays with handcarved floral design with Handle at the top and Bottle Rack at the bottom Tray. For details regarding assembly, please search for Aarsun Woods on YouTube. Sheesham wood is the most popular Indian wood across the globe known for its durability, natural rich grains, and longevity. Unlike the board furniture, solid wood has natural grains which varies from piece to piece, thus making each and every piece unique. Textures if solid wood sets it apart from the board-made furniture. Caring: Use a table cloth or any thick quality cloth to wipe it clean. To protect it from fading, avoid keeping the product near windows where it can be exposed to direct sunlight.